Steve and I wanted to tell you how much we appreciate you. Although I may be a polite Texas boy....I do not hand out compliments easily! The vows you wrote for us were eloquent perfection. You were more than an officiant, you were genuine and compassionate and spoke with conviction. How special for us, that someone we have never met prior to our wedding day could be able to be such a "real" part of this moment. By the time we were married, i felt like a friend had just married us! Peter officiated our wedding this past Friday at Brooklyn Winery, and we couldn't be more pleased. Peter was a pleasure to work with leading up to the wedding -- he answered all of our questions, put us at ease at our first meeting, and was more than responsive from the day we booked him until the day of our wedding and he easily guided us through the whole process. But more importantly than that, Peter created a beautiful, personalized ceremony for us that exceeded all of our expectations, and he delivered it beautifully. It has been less than two days that we've been married, but we have already received countless compliments from guests about how wonderful Peter was and how impressed they were by the extremely beautiful and thoughtful ceremony. We absolutely couldn't recommend him more! Peter was fantastic; at all times professional, friendly, supportive and sincere. .....Nearly one month on since our amazing wedding day, which was held on a crisp November day under crystal blue skies, it's time to acknowledge that person who made it possible, Peter. We had planned a visit to NYC for a holiday and decided whilst there we would get married. We are both Australians and sadly our own backward country does not allow gay marriage and so we turned to the state of New York and with Peter's help it happened, smoothly. .....How do you plan a wedding in a foreign country? After a little bit of Google and a few emails later we were under way with the guidance of Peter. He was incredibly helpful and was able to assist us with all the required documentation and locations of where to go and when. No email had a question too small or too large for Peter to handle, we kept sending them and he kept answering them happily. .....We were a small gathering made up of close friends from London and NYC. They all commented on Peter's sincerity in delivering the words used in expressing our love and the commitment we have for each other. We were involved in writing the words used in the ceremony but primarily it was all Peter's work. .....Thank you Peter for making our marriage a seamless and enjoyable experience. Something we will never forget. While researching wedding officiants, we were unsure between the common options of a “standard” ceremony versus a “customized” ceremony. The prior sounded too plain but we were also not the type of couple who needed to provide input on every word of our ceremony. We met with Peter for a consultation about a month before our wedding and got the impression that he could do as little or as much as we needed, which was the right fit for our situation. He also seemed polite, professional, and experienced. After we hired him, we received his draft within a week. To our relief and surprise, it was nothing like anything we’ve heard before and yet we also didn’t have to spend much of our own time modifying it to suit our liking. Peter was open to and quick in making the minor edits we did have. On the day of, he was punctual, prepared, and again polite and professional. He was definitely one vendor we did not have to worry about throughout the planning process. We are happy with our choice and would recommend him to others, especially couples who want something special but don’t feel the need to write every word themselves and want to trust the officiant to do that on the first try. .....My husband and I got married in front of City Hall Fountain on 25/10/2014. We booked Peter a month in advance. We communicated only through telephone and email and from our first conversation on I knew Peter was a great choice. He was very responsive and willing to adjust to our needs. Most of all, the ceremony he wrote for us was amazing. He made the civil ceremony special and meaningful! We highly recommend him. We are a gay couple living in Trinidad and wanted to be married on our 25th anniversary in Central Park New York. We found Peter on the web. From the beginning we knew that Peter was the person to marry us. .....We indicted that we wanted Central Park and he asked the right questions and recommended The Ladies Parvillion for our size party of 25 people. He guided us through the park permit process and getting our marriage license. .....One of us is Catholic and the other atheist. This proved to be a challenge in terms of writing the ceremony but on the first draft Peter got it just right. .....We kept in touch throughout the entire year we were planning the wedding from 3,000 miles away. Peter always was there and a comfort to know and guide us. .....On our wedding day Peter was there waiting for us at the location and his presence and personality made us all feel comfortable and relaxed. .....Everyone one of our guests complimented Peter on his ceremony and we are so happy to have chosen him to marry us. 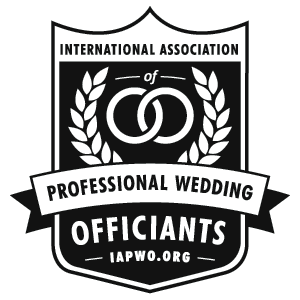 When my husband and I were planning our New York wedding (we are from Dublin, Ireland) we had no clue how to go about choosing an officiant. After reading so many reviews, we concluded that Peter's were consistently the best. Happy to say that we could not have made a better choice! He made everything so easy for us which we really appreciated since we were coming from so far away. Peter asked great questions to get to know us, and wrote the most beautiful vows that were personalized and suited us perfectly. On our wedding day, all of our guests commented to us about how impressed they were with Peter and our ceremony. We couldn't agree more! My husband and I would both highly recommend Peter to anyone who wants to get married in New York. You couldn't possibly do any better! It was as if Peter had known us as long as we had known each other. Not only was he as professional as promised, but he listened to our wishes and produced a ceremony that was just touching and resonated with our entire guest list. We actually had a sand ceremony as a part of our ceremony and he was not only open to the idea but had a few recommendations that enhanced the experience for us and our kids. The order and length of program was just perfect and the actual content provided the balance that exuded love and respect for each other while covering all of the necessary traditional basis. After the ceremony, Peter executed the signing and delivery of our marriage license in an efficient manner which further demonstrated his level of professionalism and promptness. I would recommend Peter for anyone wishing to get married, you will definitely be very satisfied. We eloped from Ireland to NYC and got married on the 7th October. From the first contact with Peter I knew we had made the right choice! Coming all the way from Ireland and not knowing how the process in New York works, Peter was extremely helpful from start to finish. He advised how to get the marriage licence and where is the perfect spot in Central Park to get married and I'm pretty sure he made the sun shine that day as its always raining here at home!! .....Peter was so easy to communicate, every email I sent was responded to immediately and I was made feel so at ease that when I saw Peter that day I felt we had met already! .....I would highly recommend Peter as a wedding officiant, from his helpful demeanor, friendly attitude and smart attire I just knew my day was going to go ahead without any problems. Peter was a true professional. We tend to be very picky about what we like and don't but we agreed that there was nothing more we could ask from Peter. He was attentive, showed up early, looked good and gave a very touching ceremony. He was also great to bounce questions off of regarding the wedding licensing process and he got our license submitted so quickly that we had a copy of our wedding license registration waiting in the mail for us when we returned home from our honeymoon! Highly recommended officiant. P.S. - He was also very professional and helpful in compiling the draft of our ceremony and he included all of the (very minor) edits and suggestions we made. We are so happy with Peter's services! Our guests raved about our ceremony. Peter was very responsive and thorough as we planned / customized our ceremony. Peter, we can't thank you enough! Peter was easy to contact and responded very quickly to emails at every stage. We had no problems arranging an initial face-to-face meeting with him. He is very organized and sketched out a draft of the ceremony early on. He was very amenable to our suggestions about things to add, cut out or revise and had no issues with our doing unconventional things like showing 10 minutes of DVD video clips as part of our vows. Also, Peter was able to incorporate elements of a Jewish wedding where we suggested such elements. .....On the day of the wedding, Peter came early to our out of town wedding in Westchester County and made a number of suggestions about the ceremony room to improve the photos and videos to be taken and other aspects of the ceremony. .....Peter is a former actor and was able to project well in a large room with 110 people even without a microphone. .....Illustrating Peter's ability to think on his feet and improvise when necessary, we had planned to add a little part to the ring exchange where we each would recite the inscription on the ring when placing it on the partner's finger but we both forgot this. Before moving on, Peter recognized this and added a comment about our ring inscriptions. We were very grateful that he did this and for his warm and supportive personality. .....His fees, including travel fees, seemed reasonable. .....A number of guests commented that Peter was "great" and "where did you get that guy?" confirming our opinion. In summary, we highly recommend Peter Boruchowitz as a wedding officiant. Peter was a blessing to us! We knew we wanted him to marry us 5 mins into our first meeting. The service was amazing. I am still getting compliments from guests 5 days after the ceremony. Highly recommended!!!! 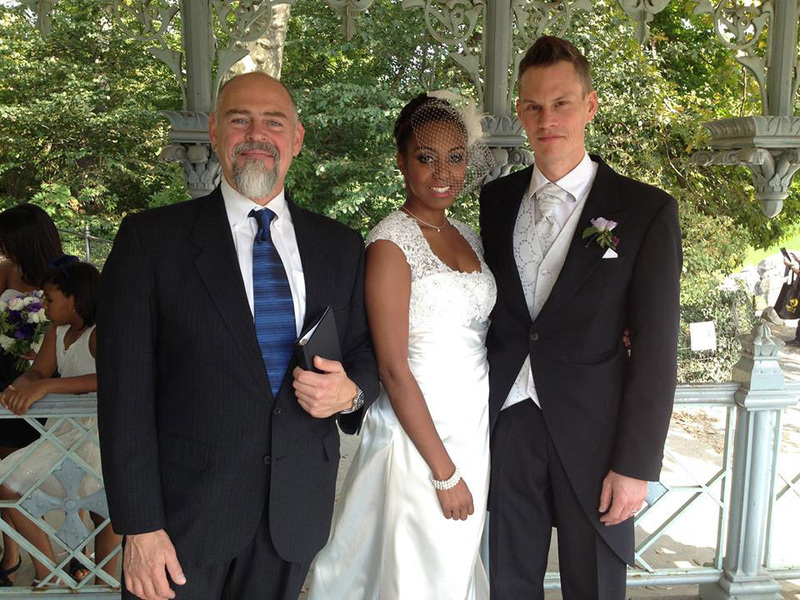 If you are looking for a wedding officiant, you can stop right here and choose Peter. My wife and I are from Kansas and we found his site online. Obviously, we took a chance since we were being married in NYC. Peter was professional, eloquent, handsome and everything we could have hoped for. He corresponded with us in advance about what we wanted in our ceremony, we responded, and he did the work. The ceremony itself was absolutely beautiful. We cannot thank him enough for his professionalism and for making our special day so perfect. Peter was a tremendous example of professionalism, looking and acting the part perfectly. He was responsive to our vision of the ceremony in the planning stages, and more than willing to make appropriate changes when asked. At the ceremony itself, he commanded the room, holding all of our guests attention and helping us through the vows with charm and grace. We would absolutely recommend him to others. Peter is a true professional. He arrived to my venue on time and went through the details with me. His words for my ceremony were so beautiful and everyone said it was one of the best ceremonies they have seen. He has a wonderful speaking voice and a great presence about him. He was charming and very kind. I highly recommend his services! We are from the UK & traveled to New York to get married Peter was so lovely! We had the most beautiful wedding ceremony in washington square park. Peter has been very profesional & helpfull with the planning of our ceremony he really took the time to find out what our personalities were like indivualy & as a could to give us a truly unique wedding ceremony that we will remember forever. It has been very easy arranging the ceremony from the UK with Peter as we have been exchanging emails for months in advance. Peter was lovely! He helpt us to choose a place and a photographer for the ceremony. The place was Shakespeare Garden with all the tulips in full bloom. It was really beautiful. Peter was super professional and it couldn´t have gone any smoother. We are really happy that we chose him! We are from Dallas and traveled to New York for our wedding. I cannot tell you how wonderful Peter was. First, he was so helpful in the planning stage and through his experience and efficiency made planning the ceremony so easy. As for the wedding itself, Peter was amazing. First of all, he looks the part. He will be a great addition to your pictures. Even more importantly, his conduct of the wedding was perfect. His theatrical training and great voice was obvious. He read the words of his service with such warmth and emotion, as if he had known us for years. While I had read the words on paper in advance, they took on new meaning hearing them said by him. Anyone considering an officiant should stop when they get to Peter. Peter was so accommodating for my wife and myself. We flew in from Michigan to get married and had a very short window to do this. Peter went out of his way for us and made our day so special, we will never forget Peter. I wouldn't hesitate one bit on recommending Peter for your special day. Peter was a perfect choice as our officiant. He was quick to respond and helped us out with both the venue and the wording of the ceremony, and was easy to work with, tailoring the ceremony to our wishes.He put together a beautiful ceremony despite the short time frame we had given him. He was also very quick in handing in the paper work to the City Clerk resulting in us getting our marriage license sooner than we had expected. Peter is an absolute professional that understands your wants and needs. Wow!! We could not have asked for a more professional, thorough, warm, and delightful person. Coming from Florida to New York for our wedding, he guided us all the way through every detail - from how to obtain the marriage license in Manhattan at the downtown bureau, to composing our ceremony and helping to write our vows, to coming to our private suite at the Waldorf-Astoria to perform the ceremony itself. He was always there - we never worried about any detail. What a first rate experience - I would recommend him highly to anyone who wants a very special wedding experience. In fact, I already have! Thank you so much, Peter!